The most important of the natural defenses against tooth decay is saliva. Saliva, the fluid that is normally present in the mouth, is produced by the salivary glands located around the mouth. A normal healthy individual can produce up to 1.5 liters of saliva per day. If salivary flow is disturbed, tooth decay can progress very rapidly. The contents of saliva can be analyzed using a saliva test. How can saliva test predict tooth decay? Tooth decay detection is done visually, sensed using a probe and also by means of X-rays. There are various tooth decay risk assessment methods and activity tests available like saliva test but are mainly used to educate and motivate individuals to realize the effects of good oral hygiene regimen. Thorough plaque (the bacterial biofilm on the tooth surface) control still remains the best method of preventing tooth decay. Snyder Colorimetric Test – your dentist will ask you to chew on a piece of paraffin and the resulting saliva is stored in a sterile bottle. The sample is examined daily for three days and the color changes are recorded. Color changes from green to yellow indicate the amount of pH change which can point to bacterial activity in the mouth. Salivary Reductase Test – the saliva sample is mixed with a dye and the color change is recorded. It is used to measure the activity of reductase enzyme present in salivary bacteria. Streptococcus mutans Count – the saliva collected is used to count the colony units of S.mutans, which is one of the main bacteria involved in tooth decay. Salivary Flow– unstimulated saliva (regular saliva at rest) is first collected and then measured then the test is repeated with a stimulated salivary flow. Results are compared and the salivary flow rate is determined. Disclosing agents – this is a self-evaluation tool using liquid or tablets to enable you to visualize the location of plaque deposits. Methyl Red-Plaque-Sugar Test – this test is used to measure the degree of acid production in your mouth. Transillumination – a strong, direct light is focused on the surface of your front teeth to detect decay in between the teeth. Laser Detection Device – this device uses a laser light system with a defined wavelength to help detect demineralized tooth structure without X-ray exposure. Saliva testing is beneficial even if you do not show any signs of tooth decay to determine any vulnerable sites that may have early decay activity which is only identifiable using a bacterial test. The early lesion can then be controlled with good oral hygiene that includes proper tooth brushing and the use of mouthwash. What is a Saliva drug screen / Oral fluid-based drug screen? 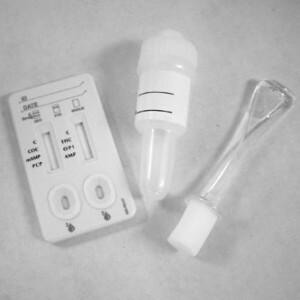 Another usage for a saliva test is to detect drug usage during the previous few days. More widely used by employers to check on their workers, saliva tests are considered a possible alternative to urine drug testing because the concentration of drug in saliva is thought to reflect the drug concentration in blood. Typically two swabs are taken in a saliva test– the first for screening and the second for confirmation. How is saliva collected for a saliva test? Tilting the head forward and allow saliva to freely flow from the mouth to the container. Sucking out saliva through a tube using a vacuum pump. Placing a cotton swab in the mouth and allow saliva to be absorbed over a period of time or until saturated. Saliva from a particular gland is collected by isolating the salivary gland ducts with special devices or by cannulation. For investigation purposes, saliva secretion is usually increased. Flow may be stimulated by chewing gum, using citric acid crystals or candy. Changes in saliva flow will change saliva pH and it may affect the concentration of drugs found in the saliva. Saliva has many functions. Saliva not only physically removes dietary substrates and acids produced by plaque from the mouth, but it has a most important role in buffering the pH in saliva and within plaque. Fast-flowing saliva is alkaline and is vitally important in raising the pH of tooth plaque previously lowered by exposure to sugar and carbohydrates. Low pH can lead to demineralization of tooth substance which can initiate tooth decay. Saliva can also be used to detect drugs in our body system and it may also help in diagnosing certain diseases therefore do not underestimate this watery substance in your mouth. This entry was posted in Oral Care and tagged drug saliva test, good oral hygiene, saliva drug screen, saliva test, tooth decay on November 16, 2009 by oileng.